The “war on pollution” started a year earlier is having some effect, but hazardous emergencies are still in the hundreds. Only eight of China’s 74 large cities have managed to meet official air safety standards in 2014, according to the Environmental Protection Ministry. This is five cities more than in 2013, when only three cities – Haikou on the island of Hainan, the Tibetan capital of Lhasa and the coastal resort city of Zhoushan – officially met air quality standards. 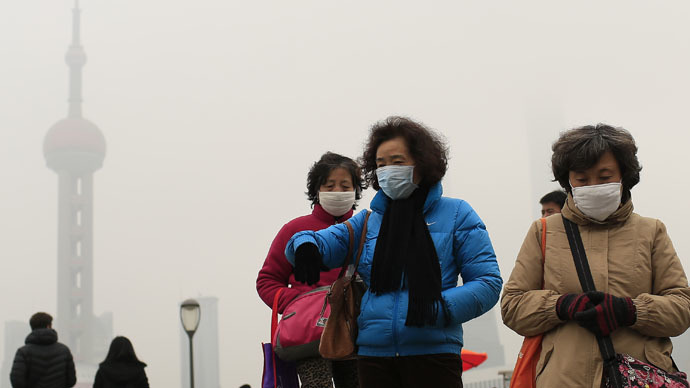 Seven of the 10 most polluted Chinese cities are around Beijing, despite the capital’s efforts to combat the situation. There were also “471 environmental emergencies in total in 2014, down 241 from a year earlier,” the ministry also said. The particles considered to be most harmful to health – PM2.5 – are slowly decreasing, down to 93 micrograms per cubic meter from 106 this year in Beiging, Hebei and Tianjin region last year. But that’s still three times the approved limit of 35 micrograms. China, however, does not expect to reach the safety standard before 2030. A government official in mid-January blamed the pollution in the southwestern Sichuan province on bacon, of all things. Apparently, levels spiral out of control as locals engage in the age-old tradition of smoking bacon on the eve of the Chinese lunar New Year, which this year will fall on February 19. Coal production remains another contributor to air pollution – a dirty industry that has earned China a lot of notoriety. The Hebei province worries the government more than any other place, as six of its cities have all scored off the charts for smog and coal pollution. They alone account for 60 percent of the entire pollution. But the sticking point is to find alternative sources for energy. So far the government has only been shutting down factories. The one bright spot in all this is the Pearl River Delta: its PM2.5 levels are within the legal and health limits. But the No. 1 pollutant there is ozone.